Have you ever felt lost amid all the things you want to accomplish or all the tasks you need to do? Have you ever felt like your brain was so scattered, you couldn’t keep a clear thought in your head or a clear direction. Sometimes, when I’m feeling that way, I make a mind map. The main objective of a mind map is to take a large project or idea, and break it down into bite-sized chunks so you can deal with it on a more manageable scale. It’s a great way to get all your thoughts onto one piece of paper and see how they fit in with the main idea. First, think about one main topic. For instance, “Job Promotion.” Write the main topic in the middle of a large piece of paper. Then, think about big-picture actions that will support your main topic. These actions should be broad and kept between one and three words long. For this example, you could write: “Networking,” “Major Projects,” “Meetings,” “Update Wardrobe,” etc. Draw lines or arrows connecting your main topic to the supporting topics. Then, think about what, specifically, you could do in each area. For instance, under the Networking box, you could write: “Attend weekly happy hour” or “Arrange for coffee with boss” or “Get to know three new people this month.” You can get as specific as you’d like, creating as many branches as are necessary to capture all your ideas. Mind maps are meant to help you sort out your thoughts and they might seem messy on the surface, but they are a useful tool for getting your ideas out there and seeing how things connect. 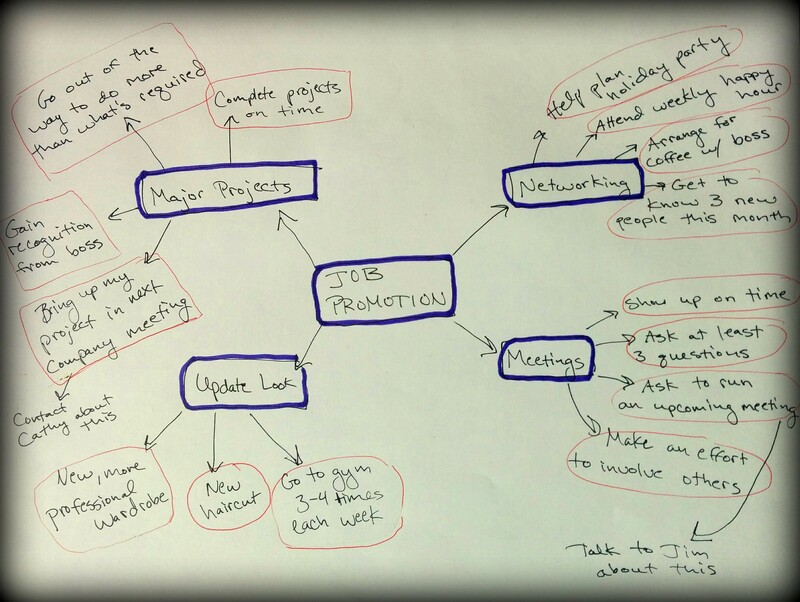 Once you create your mind map, try focusing on specific areas in order to achieve your goal. If you take on too much, you’ll get nowhere, so start with one or two goals and then create a more specific action plan revolving around each goal.